[prMac.com] Cologne, Germany - Ahoiii Entertainment is proud to announce that from now on, parents can download the update of the currently featured children's app Fiete Cars (v.2.0.0) on the App Store for free. The game is suitable for kids 5 years old and up. Fiete is the name of a little sailor. He is the hero of now 9 apps by Ahoiii Entertainment, with whom children worldwide can learn something through playing. To build individual car routes the kids can use lots of funny building-parts and special-effects, like muddy oder curved roads, farting pads or speed ramps. The handling is easy. The children just need to tap on the items with their finger and place them into the landscape wherever they want to build their roads. For trying out the self built racing tracks the kids can choose Fiete or his friends as drivers and lots of amazing vehicles. With 20 brand new ones the current app update of Fiete Cars now includes 40 funny cars, flying objects and animals, e.g. UFO, schoolbus for animals, rocket, elephant, hovercraft, fireengine and many more. As the app Fiete Cars has no special target the kids need to reach, they are having the freedom to invent own storys and to decide what will happen in their game. Everything is possible. Thus it takes place that the driver granny Lara found a new hobby: She loves to do daredevil stunts over speed ramps with her monster truck. Or sailor Fiete rides with Dolly the horse along cow's pastures to his meeting with Emma. But Emma is late - it would have been better if she had not taken the supposed shortut over the broken roads with her Oldtimer. Fiete Cars gives children room for free play. 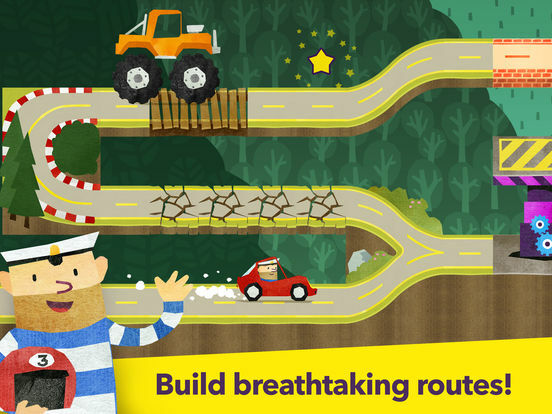 Building own car routes encourages the imagination and creativity of the kids and motivates them to independently develop ideas and solutions for their game. "What began with the focus on creating beautiful and fun apps for kids, that encourage the children to learn something through playing, has lead to developing the brand Fiete," explained Sarah Walitzek, Project Manager for Koln based Ahoiii Entertainment UG. "It all startet when two of the team members of Ahoiii became parents. The first app Ahoiii developed was actually made for their own kids. Just for fun they uploaded the lovingly and beautiful illustrated app with sailor Fiete on the App Store and were finally overwhelmed by the enthusiastic feedback from thousands of parents. With the intuitive gameplay, the handmade look and his friendly character Fiete conquered kid's and parent's hearts over night worldwide. Since then the world of sailor Fiete grows constantly." Fiete Cars 2.0 is free (with in-app purchase), and is available worldwide through the App Store in the Education category. The free version includes all of the 25 street parts and special effects, 6 drivers and 2 cars. For only $0.99 (USD), users will get the full version with 38 additional vehicles that children can drive with. For more information or promo code request please contact Sarah Walitzek. Headquartered in Koln, Germany, Ahoiii Entertainment is a small privately funded studio founded in 2012. 9 apps with Fiete are available on the App Store and on Google Play. Almost each one has been awarded several times e.g. with Red Dot Award for Best Game Design, Academics' Choice Award or German Computergame Award for Best Kids Game. Since 2015, seven books have been published. A TV series is in progress, with its guiding principle in making kids curious about the world. All Material and Software Copyright (C) 2017 Ahoiii Entertainment. All Rights Reserved. Apple, the Apple logo, iPhone, iPad and iPod are registered trademarks of Apple Inc. in the U.S. and/or other countries.